The Guru is THE great all round freeride board. A durable and affordable solution that comes with a great shape for comfort on the run. A range of boards you can progress on all the way up to making your first jibe! "The shape is based on the standard version of the Rocket range. With the softer and heavier construction, the boards are easy to ride. Fun for all regardless of whether they are a beginner or starting to windsurfing again or just want to take a spin on holiday. Soft and easy underfoot and wide enough for easy up hauling. The boards last no longer than the normal Rockets but they are so designed that even the hard “school life” can not hurt them. The complete range of Guru’s from 2013 remain unchanged in all sizes 125,135,145 and 155. This inspiring range of boards makes sailing easy, fun and affordable!" School Board, beginners Board and intermediates dream, the guru makes it all easy. 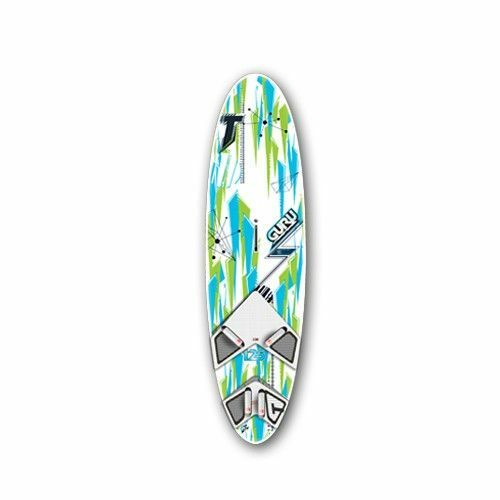 The perfect first freeride board at an affordable price and in a very robust design. A variety of strap positions offer the possibility to fit the board exactly to your needs.